Indeed a stupendous show by Indian skipper in centurion by thrashing Proteas attacking bowlers and win over South Africa by 8 wickets. Chasing run of 205, India lost its hitman merely at the score of 15 which send assumption for everyone to witness a tight game between visitor and host. But denying everyone speculation Virat Kohli made the chase an ease to watch. In fact, Virat scored his 35th century with two massive sixes showing his greatness both as a batsman and captain. Gabbar of team India established a partnership with the skipper of 67 runs after his dismissal, Rahane (34*)and Kohli(129*) made a partnership of 121 runs. Above that when batsman from both sides finding it difficult to hit shots through the middle of the bat, Virat made it look quite ease by hitting 19 boundaries around critical areas of fielders. Former cricket Sultan of Multan went ahead by predicting 64 tons for #imkohli. Master blaster congratulated Kohli for achieving 35th century in ODI and luck for upcoming matches. Michel Vaughan, former English batsman through his twitter handle tweeted Indian skipper as the greatest ODI player. Well deserving of all praises, Virat broke the records including highest run scorer in bilateral series and as highest run-getter by a Captain. Moreover highest run against South Africa by an individual Batsman. 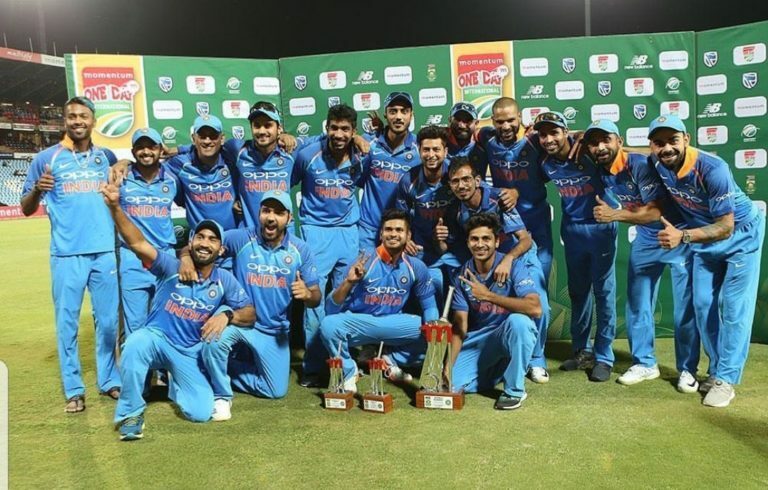 During post-match interview, Indian skipper emphasized that they play for representing India on the international platform rather than making headlines. He further added Indian skipper is not competing with anyone and associating tag along with his name won’t make big difference for him as opine on his team matters. India performance in first two test matches attracted many critics for not playing as a no.1 test team, switching to revenge mode India too defeated South Africa who was holding number one spot in ODI. Connecting with it, scored three century during 2015-2016 tour against India now Kohli making it even with three century and the highest scorer in bilateral against the rainbow nation. Indian coach Ravi Shastri sitting alongside Indian skipper during the post-match interview admitted Kohli as the greatest batsman in the world. Veteran former captain of SA Shaun Pollock advised Indian skipper to control his aggression during captaincy though it might be fruitful in his personal game. And referred men in blue as unidirectional in this series. With three match series of T 20, India will try to win and conquer this tour to South Africa. Gaining momentum from last test win and a 5-1 win over protean, India would like to maintain its intensity in upcoming games. Crix11.com prediction whole time in this series proved to be close by and in fact, helped out many to get genuine news directly to our readers.